What Do They Want? DVD by Dr. Nate Booth – Free Video Clip – Discount! Most salespeople and service professionals use the spray and pray approach. They conduct business in a predictable, methodical manner with every prospect or customer, treating them all pretty much the same. 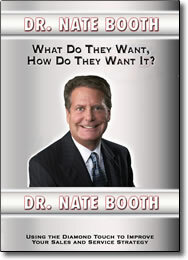 The fact is, everybody has a unique way in which they like to be treated, and Dr. Nate Booth shows you how to uncover what’s most important to each individual you deal with. In this basic and profound program, you’ll learn the importance of discovering what people want, and exactly how they want it. Not only does he apply it to sales and service, he also shows its tremendous value in relationships, both business and personal. In this day and age, where relationships are King, and customer service is Queen, nothing short of the royal treatment will do.